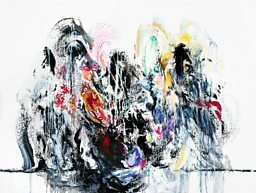 WILLIAM COOK meets painter and sculptor Maggi Hambling as she prepares for her new exhibition, Walls of Water, at the National Gallery. The controversial painter and sculptor became the gallery's first Artist in Residence in 1980. We're standing in Room One of London's National Gallery, surrounded by Hambling's latest seascapes. She started working on these eight paintings four years ago, inspired by another storm, in Southwold, near her Suffolk home. 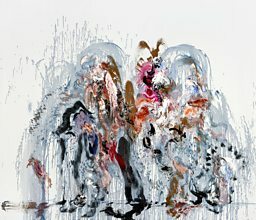 It's easy to understand why Hambling's new exhibition is called Walls of Water. These seascapes are very big, seven feet across and six feet tall. In this windowless room they seem even bigger. 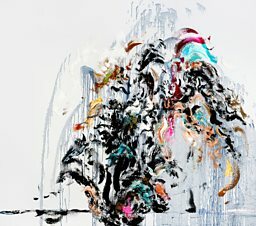 Hambling's painting style is almost sculptural, her use of colour is explosive. Standing here, with these dynamic canvases all around you, you can see exactly what she means. It feels like treading water in the eye of a perfect storm. At first her pictures look fairly similar, variations on a theme, but as your eye adjusts you realise they're as varied as the ocean. Some are full of sound and fury. Others are quite playful. Her palette ranges from thunderous grey to skittish pink. There's only one picture in this show which isn't of the sea, and that's her tribute to Amy Winehouse. It's smaller than all the others, in a space on its own, beside the door - but though the subject is completely different, this feels like a fitting place for it. This was actually her third attempt. She'd painted two previous pictures of Winehouse, more figurative than this one, but she destroyed them. Does she ever regret destroying her own work? 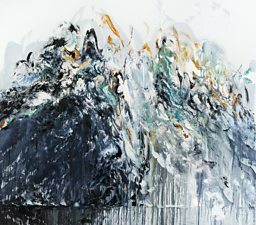 In 1980, Hambling became the National Gallery's first Artist in Residence, so this exhibition is a sort of homecoming. She also took groups around the gallery, and talked to them about the collection. 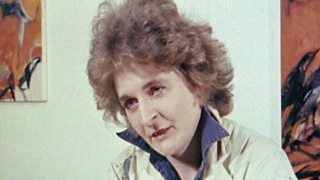 'I always went to The Execution of Lady Jane Grey by Delaroche to tell them it was the worst painting in the National Gallery.' Several years later, she heard it had been voted the National's most popular painting. 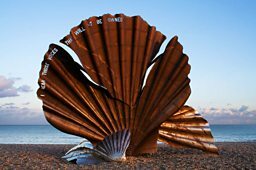 Her own work also divides opinion, particularly her huge steel Scallop, which stands on the beach in Aldeburgh, near her Suffolk home. It's a tribute to Benjamin Britten, who lived and worked in Aldeburgh (Maggi is a great admirer of the composer). She once joked that she'd be happy for people to make love beneath it. 'I believe that has happened! Children on the top, and who knows what underneath! It's a user friendly piece of sculpture!' It’s refreshing to meet an artist with such a healthy sense of fun. Her statue of Oscar Wilde, on London's Strand, has also been vandalised several times. Like her Scallop, it's prompted strong reactions – both positive and negative. Few people remain indifferent to Maggi Hambling's art. 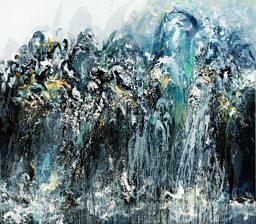 • Maggi Hambling: Walls of Water is at the National Gallery, London, until 15 February. The selected images below feature in the exhibition.